Goodreads Challenge – I’m going to read a minimum of 65 books this year. I know its not much, but I didn’t want to push myself cause there’s University sucking my time as well. Flights of Fantasy Reading Challenge 2015 hosted by Alexa Loves Books and I’m planning on reading about 15 fantasy books for the challenge! A SERIES A MONTH READING CHALLENGE hosted by Danielle and I’m super excited about this one since there are a lot of series I’ve been wanting to complete! The Re-Read Challenge hosted by Hannah and I’m planning on reading the entire Harry Potter series, a couple of Enid Blytons, all the Dan Brown books and The Inheritence Cycle, along with Insurgent and Mockingjay before the movies premiere. 2015 Chunkster Challenge and I’m gonna try and read about 7 gigantic books! 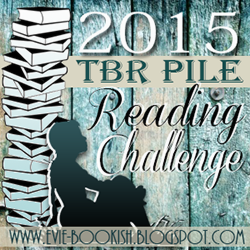 2015 TBR Pile Reading Challenge I’m headed for 24 physical books on my TBR. And finally, The Netgalley Challenge and I’m hoping to complete many books. Not pushing myself though, cause I have over 150 review copies on there and its just intimidating. Sounds like you’re going to be BUSY! Thanks for the heads up — I might try ONE of them. I know right? I just hope the books I chose are like common in a few challenges so that I have time haha.